JAXA | Ryouichi Imai, Vice President, JAXA "JAXA Has Made a New Start"
Ryouichi Imai, Vice President, JAXA "JAXA Has Made a New Start"
Based on the government’s Comprehensive Strategy on Science, Technology and Innovation of Japan, on April 1, 2015 the Japan Aerospace Exploration Agency (JAXA) made a new start as the National Research and Development Agency, Japan Aerospace Exploration Agency. 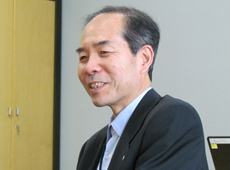 We asked JAXA’s Vice President, Ryouichi Imai, who is in charge of the Research and Development Directorate, how this new designation is going to change JAXA. — Why has JAXA been made a national research and development agency? The purpose is to maximize Japan’s research and development results. With many research organizations working closely together, we aim not only to develop technologies that can be successful around the world but also to use our innovative research achievements to create new value to contribute to society. — How is JAXA going to change? Now that we have become a national R&D agency, our role has become more clearly defined. As Japan’s core aerospace-technology organization, JAXA is to develop technologies that can lead the world, and to use these technologies to help solve social problems. To this end, 13 existing research groups, focused on different basic technologies, were consolidated into four units, so that we can work on solving specific challenges more quickly and efficiently. Previously, research was conducted by groups specializing in different basic technologies, such as the Trajectory and Navigation Group, the Guidance and Control Group, the Telecommunications and Data Handling Group, and the Space Power Systems Group. Each of these groups worked more or less independently. For example, when a problem occurred in a power system, the Space Power Systems Group would try to resolve it by itself. It makes more sense, though, to approach the problem from a system-wide perspective, taking more than just one basic technology into account. So we have integrated the research groups that were responsible for power systems, control, telecommunications and devices, etc., and named the new group Research Unit I. We also have Research Unit II, which integrates groups that work on robotics, structures, thermal systems and fluid dynamics; Research Unit III, focusing on software and computational engineering; and Research Unit IV, which works on the technology for transportation-vehicle engines. Even so, it is unlikely that any of these larger units will tackle any specific problem alone. Instead, the leaders of the four units will get together to assign suitable members of their units to work on specific projects. By having researchers team up like this, we aim to maximize our results. — So you mean that, from now on, JAXA is going to wipe out the conventional boundaries that had existed between different fields, such as between satellites and rockets? That’s correct. We will leave behind the conventional way of thinking, and break down the wall between rockets and satellites. Instead of looking at satellite technology and rocket technology as two different fields, we will look at the sequence comprehensively – from the launch of a satellite by rocket to the operation of the satellite in orbit – and think about what kind of new technology needs to be developed. So the question is no longer about developing rocket technology or satellite technology, but about what we want to accomplish in space. Once we’ve answered that, we’ll design a research plan to work towards it. Let’s say we want to cut the cost of transportation by half. Why half? Because, for example, this would make it will financially feasible to provide new communications services from space. So we set a goal for transportation systems research, based on our prediction of the services we can create and their ultimate business value. I think that working like this, we can come up with various research topics. We plan to work with external organizations to create an environment where people can brainstorm ideas and carry out research from development to application. That will allow us to create new technologies that are world-class and made in Japan. — How many research topics are there at JAXA? As a matter of fact, our audit last year revealed that there are about 330 research topics just at JAXA. We investigated them, and found two major problems with that. First, the topics are too subdivided and lack horizontal connection. Many research objectives are about improving an existing technology or enhancing its reliability, such as making a system lighter or more durable. However, researchers are not communicating with each other to maximize their results, as there is no structure in place to promote this. Secondly, there are too few innovative research projects based on principles or ideas departing radically from convention. Unless your research tries to make a leap to another level and generate new value, you cannot compete successfully in the tough international environment. We know this, but nevertheless, there are still too few research projects that satisfy this need. Without solving these two problems, we cannot optimize our R&D results. This is why, last April, JAXA became a new entity to facilitate flexible interaction and collaboration among researchers, and the sharing and integration of technologies. We will sort a number of research topics into pillars, and build a system where researchers in different fields can work together. We would also like to create as many opportunities as possible for innovative ideas to come to fruition. At the moment we are discussing the core research topics we should focus on. I think we will be ready to launch our new research projects within this framework around October. Later on, based on the PDCA cycle, we will continue to make efforts to implement as many research results as possible, so that we can make positive contributions to society. — So JAXA is going to try many new things from now on. JAXA needs to prioritize properly addressing existing projects. And, as we pursue that work, we should push for research that can generate new value. So we are going to classify research into two pillars, Research to Support and Research to Lead. Research to Support projects are tangible, such as on-going research or a soon-to-be project; Research to Lead is research to find solutions to future challenges. Let’s look at rockets as an example. Trying to reduce the weight of the structure, or power consumption, for the H3 rocket, our next-generation launch vehicle, is Research to Support. And developing engines or technology for the fuselage structure for reusable rockets is Research to Lead. 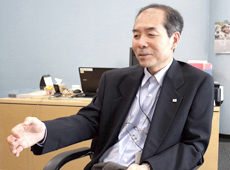 — Will JAXA staff, as individuals, have a chance to advance their ideas as well? Yes, of course. We will not limit the time frame for accepting ideas only to the beginning of the fiscal year, but will be open to suggestions throughout the year. However, when we take on a new idea, we have to assess its true potential. But if we judge the idea based only on conventional values, we can ruin it. So our judgment will be tested, too. To improve our selection process, JAXA is implementing a new system. Some of our leading technology experts will listen to ideas from staff members, and give advice. If there is a good idea, they will help develop it. I think receiving guidance from one of JAXA’s star engineers will have a positive impact on the development of human resources. At the same time, individuals cannot neglect efforts to promote their ideas outside JAXA. I think it is important to try to further develop your research by presenting your ideas at academic conferences, for example, and responding to feedback or involving supporters. — How are you going to collaborate with other research organizations? We have collaborated with other research organizations, but we would like to further strengthen such relationships. For example, in the Tsukuba area, where the Tsukuba Space Center is located, there are many national research organizations, such as the National Institute of Advanced Industrial Science and Technology (AIST) and the National Institute of Materials Science (NIMS). So researchers often visit each other in their offices to exchange ideas. Previously, their interaction was more on a personal level, staying in touch with scientists they had met at conferences, for example. Now we are making sure that both the heads of research organizations and the scientists visit each other in their offices to share their challenges and discuss solutions. Some people seem to be finding that this helps them see things more clearly, and that their knowledge can contribute to each other’s research. So I am hoping that collaborative research, supported by such extended communication among researchers, will result in creating new value. Beyond the aerospace field, if we can maximize comprehensive strength as an all-Japan team, I think we can help enhance Japan’s research results. — One of the goals of JAXA becoming a national R&D agency is to use aerospace technology to help solve social problems. What do you think about that? Many of JAXA’s accomplishments have high potential to be applied to social infrastructure. Our photovoltaic technology is one example. Large solar panels will be deployed in orbit, and the solar energy generated there will be sent to the ground and converted into electricity. It will take time before this can be put into practice, so if a new, useful technology is developed in the meantime, we will not miss the chance to bring it out. Indeed, many of our highly reliable space technologies are already being adapted for consumer products, although this may not be obvious from the outside. For example, the thermal control technology for satellites can be used for thermal control in 4K/8K ultra-high-definition televisions, and electronic components from satellites can become components of autonomous cars. If you broaden your horizons and stay in touch with people outside your organization on a daily basis, it can increase the chances that space technology can spread to non-space applications. I think this can also help enhance the value of our research. — What kind of research results do you expect to come from the new JAXA? Now that researchers in different fields are working together, I would like to try new things by integrating different technologies. One of these is robotics. Robots involve machines, power and software – so they are an aggregation of technologies that have been studied separately. I think that the technology that enables robots to explore autonomously is very valuable, because it can be applied to a robot that can perform disaster relief or carry out tasks in dangerous places on the ground. I am also very excited about new ideas that we will find. Japan’s satellites and rockets are now reaching one phase of completion, and I think our aerospace technology is at a turning point. It takes time and money to develop satellites and rockets, so in the past it has always been done at the initiative of the government. But recently, as the technology has become generalized, the private sector has entered the field. And as a result of the growing number of engineers who can build satellites and rockets, emerging nations such as India and China have started their own space programs, and are pushing the technology to become even more generalized. In such circumstances, what you need to create new aerospace technology is indeed wisdom and imagination. You cannot beat your rivals using just the things you’ve learned from textbooks. In that sense, it is an exciting time for researchers, as there is a good chance that their new ideas will be implemented. The ideas that have been judged to be too innovative and filed in a back drawer are the very ones that we need today. — Do you ever think about new ideas yourself? I often imagine technologies that would be fun if they existed. I am interested in space exploration using robots – I would love to see robots and humans collaborating to explore space. On the moon, for example, gravity is one-sixth that of Earth, so structure there can be light, and less energy is required. Humans would have to wear a 200-kg spacesuit equipped with life support, but robots could excel in their functionality. So maybe humanoid robots can go to the moon and build a base before humans arrive. I am also interested in using multiple satellites as a group. For a large satellite, you need a large facility to build it and a large rocket to launch it, but you don’t need these for small satellites. If we launch a few small satellites, we can use a single one for a small mission, or assemble multiple satellites in orbit for a big mission. It would be like an amoeba: looking like one larger life form, formed by a group of entities and moving together. I think if we can do it, it will be interesting. Ideas keep coming up in my head, so I can talk endlessly (laugh). — What message would you like to pass on to young scientists who will lead R&D in the future? I would like them to name a big challenge around space first, and then define a research topic in line with it. In other words, they will study a new technology because they need it to accomplish something. What I mean is that the purpose of research should not be developing a technology but finding a solution. It is like you climb a mountain because it is there – you tackle a challenge because it is there. I would like them to use their expertise to pursue goal-oriented research, and take on projects that are only possible at JAXA. Mr. Imai received his M.S. 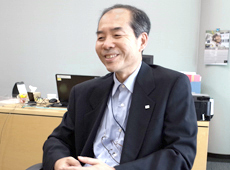 from the Department of Electronic Science and Engineering, Graduate School of Engineering, Kyoto University in 1981, and joined the National Space Development Agency of Japan (now JAXA). He was involved in the Engineering Test Satellite – III (ETS-III), Engineering Test Satellite – VI(ETS-VI), and Engineering Test Satellite – VII (ETS-VII). 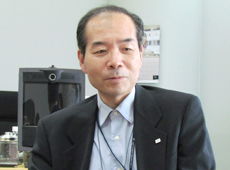 He was appointed project manger of JAXA Satellite Applications Mission Directorate II in April 2013, and Director of Management and Integration Department, Aerospace Research and Development Directorate in June of the same year. He has been in his current position since April 2015.